The Big Rip is an event in which all the matter in the universe will rip into strings. It will happen 22 billion years from now. Yes Universe, it will happen to you. 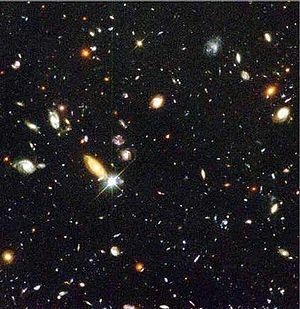 4.7 billion years ago, a force known as dark energy overpowered gravity. Up until then, the Universe's expansion has been decelerating. However, dark energy caused it to start accelerating. Eventually, dark energy will be the strongest force in the Universe. 60 million years before the Big Rip - galaxies are ripped apart. 3 months before the Big Rip - planetary systems break apart. 30 minutes before the Big Rip - celestial bodies explode. 100 zeptoseconds before the Big Rip - atoms are ripped apart. After the Big Rip, the Universe would become an expanse of space, time, energy, and strings, the building blocks of matter which are still matter. A zeptosecond is 10-19 seconds.